Congratulations! You just said “I do,” you’ve danced the night away, and now you’re exhausted. You have a reservation for tonight at the newlywed suite at one of San Francisco’s hotels, with a flight out to Italy tomorrow morning. But who will drive you? 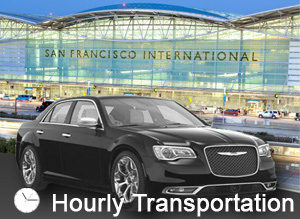 With Bay Area Hourly Car Service, we’ll shuttle you to and from any destination in the Bay Area for a low hourly rate. You tell us when and where to show up and where you are going, and our professional chauffeurs will do the rest. We’ll take you to the hotel where you can get a good night’s sleep before we pick you up in the morning to get to the airport and start the honeymoon. Not quite at the wedding yet and trying to figure out who will drive the entire bridal party? Our Bay Area Hourly Car Service will pick up the bridal party in a luxury SUV and help you have a night to remember. Your son wants to impress his date to the prom – that means no showing up in a mini-van. Showing up in one of Bay Area Car Service’s luxury cars, being chauffeured to prom, will not only impress your future daughter-in-law, but all of the other high schoolers, netting you brownie points with Junior. No kids, no weddings to attend, just wine to taste? Tell us which Napa Valley wineries you want to visit – by yourself or with your group of friends – and our hourly chauffeurs will take you on a tour of wine country, letting you enjoy the sights and tastes without worrying about driving later. Instead of getting a shuttle to and from the airport, where you are crammed in a van with people and forced to wait through four stops before getting home, Bay Area Car Service will pick you up from or drop you off the airport. No more worrying about luggage or other travelers – it’s just you. If you need to get to a business meeting but can’t lose the time driving when you need to prep your speech, we can pick you up from your office and navigate through traffic while you review your notecards. When the meeting is over, we’ll pick you up and take you back to your office. Just visiting the Bay Area? Rental cars or taking a taxi to see the sights all day can be expensive. Not using the same taxi all day means having to find a taxi at every location. Taxis are paid by distance – if you don’t know the area, taxi drivers could take advantage and take the long route. With our Bay Area Hourly Car Service, you pay by the area – regardless of the route we take. Plus, you can visit the sights knowing that your friendly driver will be waiting to open the door for you, with no waiting in line for a taxi or watching as all the taxis that go by are already filled. Ready to make a reservation for our hourly service? Call 1.800.380.9788 or click the reservation link!